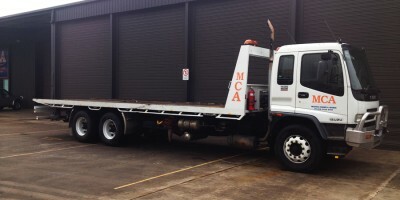 MCA offers a choice of regularly serviced & reliable Tilt Trucks from 6 tonne models through to the 12 tonne variety. Our vehicle makes and models come with tilt slide trays and boast a range of alternate features that allow you to tailor vehicles to your individual requirements. Our vehicles can carry 20ft Shipping Containers, Sheds & Pre-Fabricated Buildings, Heavy Machinery, Heavy Vehicles, Heavy Equipment, Pallets, Bundled Cargo, Oversize Items, Steel Products, Cars, Trailers, Boats etc. 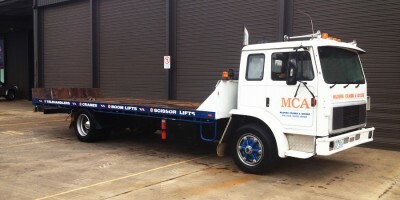 including pickup and delivery of machines that are on hire. Each Tilt Tray truck used for hire, is equipped with tools & materials to secure your load to the Tilt Tray in the safe and correct way. Our key area of operations is 300km throughout the Sunraysia region, however we can also accommodate additional areas on request.